For over 40 years, our experienced craftspeople have provided architects and designers with original designs, reproductions, and restorations created precisely to their requirements - in virtually all metals - steel, stainless steel, brass, aluminum, copper, and cast iron - in meticulous detail and exquisite taste. We are also highly regarded for our decorative rods and finials, as well as our custom designed registers, grilles, and elevator interior. 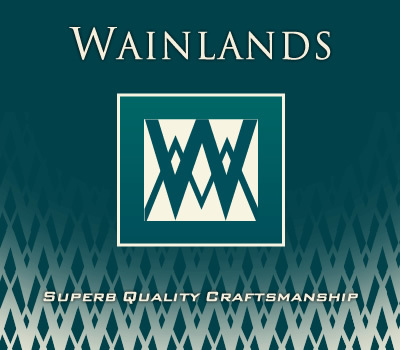 Simple or ornate, traditional or contemporary, Wainlands craftspeople create and restore railings, gates, tables, chairs, doors, lighting fixtures, and antiques. They solve the most intricate problems of architects and designers. Our reputation is impeccable. Wainlands's has the facilities, equipment, tools, and experienced personnel to carry out architectural metalwork design and fabrication of any size and complexity. PERSONNEL Each project is assigned to a lead fabricator who is responsible for every step of the production process up to finishing. The fabricator, working alone on smaller projects or with the help of other fabricators and apprentices on larger jobs, gathers materials, cuts, forges, textures, shapes, assembles, grinds, and polishes the piece or pieces of the project. MATERIALS Our lead fabricators are experienced and knowledgeable in the use of all available tools and equipment to achieve the designer's objectives. Wainland's specialists are comfortable working with a variety of precious and semiprecious metals and alloys including iron, stainless steel, aluminum, brass, bronze, and copper. FINISHING Wainland's finishing department receives each project from fabrication and uses a variety of techniques to achieve a finish that is both durable and aesthetically pleasing. INSTALLATION We normally deliver the finished product to its final destination using our specially equipped installation trucks. Our skilled personnel, under the direction of the lead fabricator, perform the installation to ensure customer satisfaction.